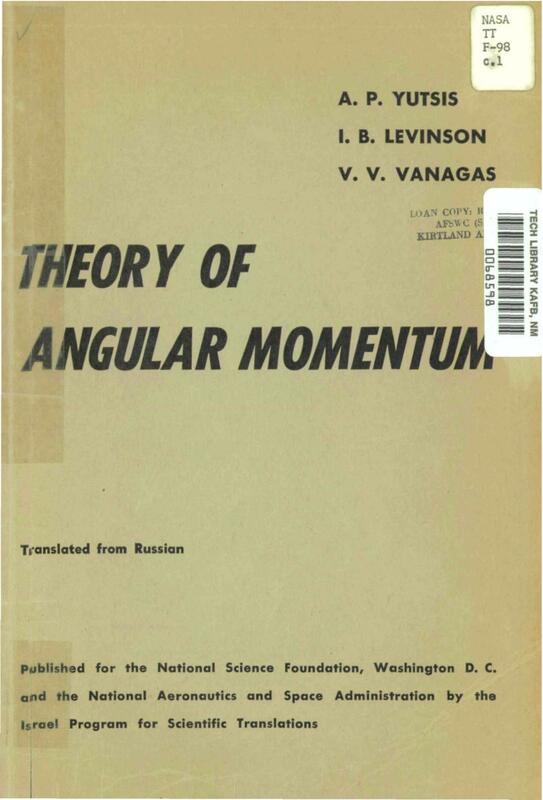 In this post, we will see the book Theory of Angular Momentum by A. P. Levinson, I. B. Vanagas, V. V. Yutsis. The principal results obtained up to 1935 in the quantum-mechanical theory of angular momentum are contained in chapter III of Condon and Shortley’s “Theory of Atomic Spectra” /1949/. Since then, owing to the ideas of Wigner /1931,1937/ and Racah /1942/, the theory has been enriched by the algebra of noncommuting tensor operators and the theory of y-coefficients. This has considerably increased its computational possibilities and has broadened the scope of its applications. Among the branches of theoretical physics where the methods of the theory of angular momentum are widely applied today we might mention the theory of atomic and nuclear spectra, the scattering of polarized particles in nuclear reactions, the theory of genealogical coefficients, etc. (a bibliography of the applications may be found in Edmonds’ book /1957/). Vilnius State University im. V. Kapsukas over the last two years. We found it worthwhile to use the elegant and powerful methods of group theory in our exposition. To avoid encumbering the book with elements of group theory we have assumed that the reader is already acquainted with linear representations of the three-dimensional rotation group. The reader who is unfamiliar with this may refer to the books by G.Ya. Lyubarskii*/1957/ and I. M, Gel’fand et al. /1958/. We begin with the well-known theory of vector addition of two angular momenta (chapter I), turning next to the addition of an arbitrary number of angular momenta (chapter II), The following chapters (III- VI) are devoted to quantities of the theory of angular momentum where an important place is occupied by the graphical method which IS convenient for various calculations. The last chapter (VII) deals with the method of noncommuting tensor operators. Material of a supplementary character is given in the appendices. We have cited a number of unpublished works some of which were not available to us. References to these were based on other published works. We apologise in advance for any resulting inaccuracy. The book was translated from the Russian by A. Sen and R.N. Sen and was published by Israel Program for Scientific Translations for the National Science Foundation and the National Aeronautics and Space Administration, U.S.A. in 1962. This entry was posted in books, physics, soviet and tagged addition, angular momentum, Clebsch-Gordan coefficients, graphical methods, israel programme for scientific translations, j-coefficients, jm-coeffcients, quantum mechanics, transformation matrix, wigner coefficients. Bookmark the permalink.